Where did the summer go? Hopefully yours was full of good memories, late nights with lots of magical star light, laughter with your kids, and mostly…a mental rest for both you and your kids! Here at Evy’s Tree, we always have mixed feelings about the end of summer and the beginning of school; we’ve enjoyed the slower pace and down time with the kiddos, but we welcome the upcoming cooler temperatures (hoodie weather!) and familiar rhythm of our family routines. Like many of you, we have ambitious plans for making the school year go smoothly, and are always looking for new organizational ideas to incorporate into our existing systems! We polled the incredible members of our Evy’s Tree Insiders FB group, and have compiled them into the three essential topics for school year success for you. PLAN PLAN and then PLAN some more! Hannah Smith – Plan/pack the lunch box the night before, on Saturday or Sunday pick the weeks clothes out so there is no questioning. These two things help me out in those hectic mornings of oversleeping. Julie Curry – As a mom – if you need to be out early in the am, let your kids sleep in their clothes the night before. Also…teach your kids to pack their own lunch. You can do it sometimes too, but they can handle this responsibility in Kindergarten. Then you can sneak little notes in. Mom of boys, ages 13, 10, 8, and 4. Amy Malaise – Invest in sustainable items for lunches!! It is so easy to spend a lot of money on plastic baggies and paper bags that you will just throw away. When my child was in Kindergarten, we bought reusable/washable baggies for snacks and sandwiches, silicone popsicle molds for yogurt smoothies, a set of utensils, cloth napkins, and stainless steel divided boxes. We are still using all of it!!! During the weekend, I often make a bunch of smoothies in the silicone molds and put them in the freezer. Not only do they keep his lunch cold but they also thaw just in time for lunch!!! Plus, no added sugar or other yucky ingredients. During the younger years, we also put up Command hooks on the wall for each day of the week. During the weekend, we picked out outfits together for the whole week and hung them on the hooks. Each morning, he took the outfit off the corresponding hook and got dressed. Saved a lot of hassle! Jennifer Mccandless Reynolds – Be prepared! We get back into our school schedule & routine a week before school starts. We start back with our school bedtime & wake up times. I also plan ahead with our meals for dinner. It helps when we get since busy with back to school & sports to have a plan so we aren’t having to eat fast food or eating supper at 9 at night. I start buying small portion Ziploc bags so I can separate snacks for when the kids come home from school ready to eat. Tracy Ward – As a Mom I’ve learned…don’t fight getting dressed in the morning. Let them pick out what they want. Who cares if they wear a tacky characters shirt or light up shoes. Take the help! I’m lucky, my husband is willing to help. He may not do like “mom would do” but he gets the job done too! Holly Larsson – We have to take our lunch because of food allergies and, well, it’s just healthier. So I make a list of all the different lunch box ideas and keep it handy for the grocery store and then to pack lunch in the morning if I am still half asleep!! Kristen Roseberry – I have a 10 and 5 year old. Teach your kids young to get their own breakfast and put together their own lunch. We also do easy lunches- a sandwich with a side of fruit and a side of veggies and water. Also put an alarm in their room and let them learn to get themselves up. You will then have independent kids getting themselves ready for school while you get your own stuff done. Shower the night before helps. And give yourself grace when it goes wrong. 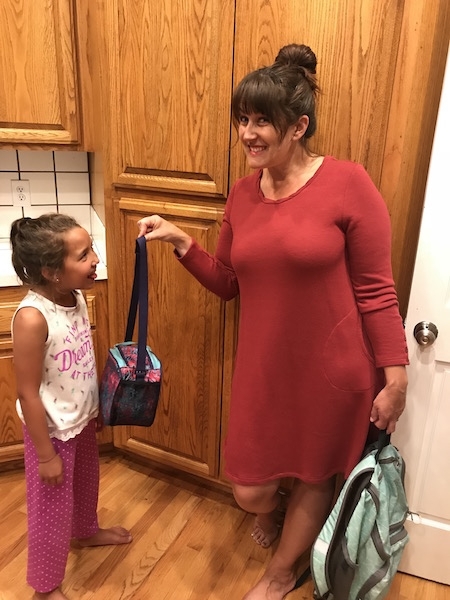 Evy’s Tree employee Samantha (pictured above wearing the Anglea in Pear) – “Every year I have the best of intention of having a smooth school year. I actually even co-authored a book on over a months worth of healthy lunch ideas for kids which is still on Amazon. I find within weeks those well thought out intentions die and I shift my gaze to most important things. I’ve learned to embrace the chaos, be patient with each other, teachers, friends and parents and most importantly to be my kids #1 fan. If I had to share one tip it would be to have a great snack ready when the the come home from school. 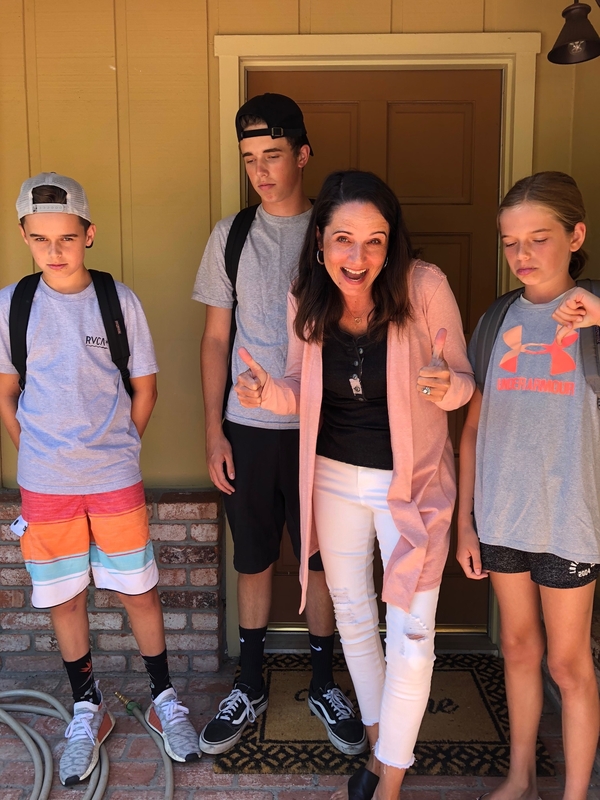 They are starving and I find that they will actually sit and share the good, the bad and the ugly about their day.” Samantha has 3 kids – Jacob is starting high school, Jonathan is in middle school and Allie is finishing her last year of elementary school. Jacob is most looking forward to his first high school cross country season. He excited to work hard and see where it will take him. Jonathan would like to open up a nightclub called Eclipse thats open twice a year with a cover charge of $5K dollars when he grows up. Allie would love to be an author of a book called the Great Blue and it would be about life under the ocean. Oh, all of that paperwork! Stacks of forms and rules and schedules and permission slips…double that stack with every additional kid…it can feel overwhelming! The key is to stay organized and on-top of it all, and remember that your kids are depending on you to not only keep them on track with all of their work and activities, but also as role models for their own future organizational skills. Staying in touch with all of your kids educational progress will help you to be their best advocate; they need their parents to be their number one support system and you can only be that for them if you know what’s going on in their school days! So pull out those lovely colored post-its, pens, and highlighters, grab a few calendars from the dollar store, and embrace your role as CEO of your kids school days! Lori Reid – As a mom… be your child’s BIGGEST advocate! Get involved in their class, meet their teachers and advocate for your child’s education. No one else will. I have 2 teenagers and an elementary aged child… this is the biggest thing I’ve learned. An active parent is an informed parent. Parent/Teacher relationships are crucial and all teachers I’ve worked with have loved my involvement and input. 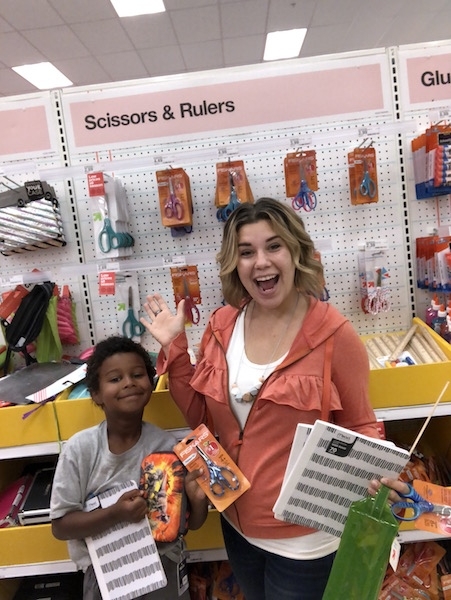 Amber Smith Hreczkosij – As a mom, I like to think through my priorities for my son at the beginning of the school year and that helps me when report cards come out and has decreased my stress and consequently the stress I put on my son. He’s in elementary school so I have to remind myself that straight A’s at this level won’t get him into college and a D in penmanship won’t keep him out of college. My goals for him this year revolve around strengthening math school and choosing kindness in tough situations. Nicole Silich White – I believe in giving “grace” the first week (or two) of school as we adjust. Create clear systems that start out strong. Everyone loves to have a “rhythm” thats familiar. 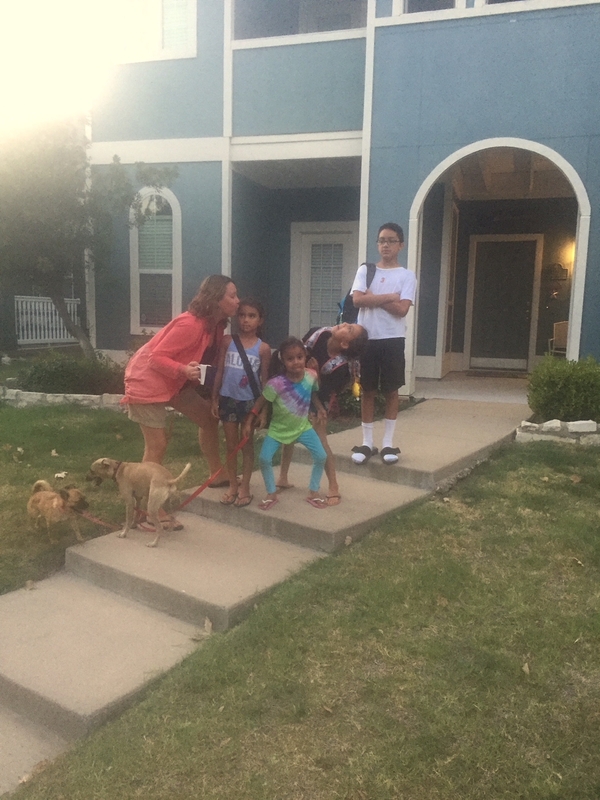 Denise Carrillo Cater – When my three were in school, I made a point to take all the school paperwork, sit down with the family calendar, and jot down every important date. The filled calendar was what kept me organized and helped me to not overbook. Evy’s Tree employee Elizabeth (wearing the Alyssa in Flamingo here) – “Organization is key, not just for school work but for their daily chores as well. But during busy times with sports, church activities, etc. just learn to embrace the chaos and simply do your best. Focus on your long term goals for them. Lastly, learn to SAY NO to activities or requests on your time that take you away from your family in ways that don’t fit what your family needs right now, or isn’t in the best interest of your family goals.” Samuel is going into 6th and wants to be a professional football player, Olivia is going into 4th grade and wants to be a professional baker with her own speciality cupcake shop, Emma is going into 2nd grade and wants to be the first woman to go to the moon (after her career as an engineer and fighter pilot), and Lily is going into Kindergarten, and she thinks she might be a vet one day. Melissa Gerbrandt-Heath – As a mom I have to say the best way to have a smooth year is by having a system of organization multiple areas of importance: such as all the papers that come home, forms to be signed, a color coded calendar to keep all activities organized. 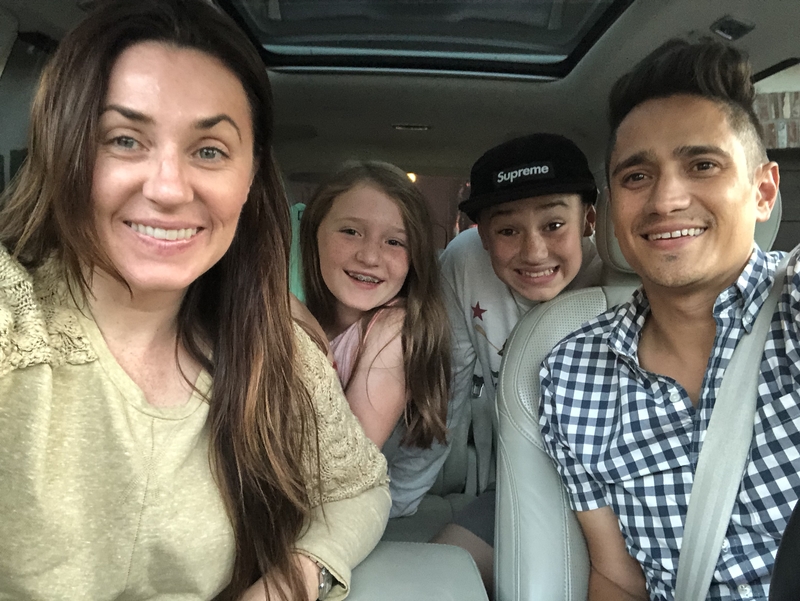 Jackie Hyde – As a mom, I like a routine after school too. We do snack and homework right after they get off the bus, then they get free time while I make dinner. Also, I go through their folders/backpacks/lunches while they are eating snack. I like to get everything out of the way to avoid things piling up and then I can have my own free time after the kids go to bed, instead of running around cleaning and organizing since it’s already been done! Dana Baisch – I have 2 teenage boys – 13 – starting grade 8 and 16 – starting grade 1, and for me the most important thing is to keep on top of the assignments and class work right from Day 1.We discuss school everyday and I help them organize/prioritize their notes and homework. Evy’s Tree Owner and CEO Amy Miraflor (wearing the Consuelo in Desert) – “School is a family affair in the Miraflor family. Our kids make their own lunches the night before. Brandon and I wake up early to work out, and then while Brandon is in the shower, I get the kids to gather their lunches + backpacks and get into the car. Brandon then takes them to school while I shower. 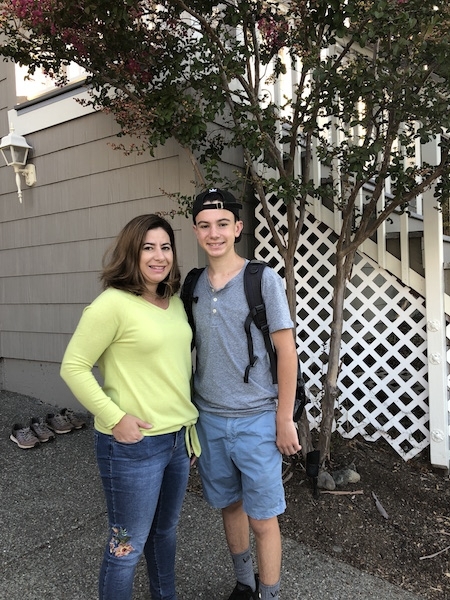 This work together system may not be everyone’s jam, but it is what works for us…and we like that we are showing our kids that tag teaming is valuable and important.” Amy’s son Jake is going into 6th grade and would like to become a professional lacrosse player. Evy is entering 4th grade, and she would like to be a horse trainer or a famous horseback rider some day. She is happily anticipating meeting new friends and having the same teacher as last year. With so many of us busy with our lives as working mothers and wives, it’s an effort to stay mentally connected to our kids and what they’re currently experiencing, especially when we can see that they’re riding the crazy roller-coaster of adolescence. But it will be worth it when we get to see what amazing adults they’ve become! Stephanie Akola Jennings – My first question to my kids is always “who did you sit with at lunch?” That tells me a lot. Are they happy? Are they bullied? Are they socializing? Is school fun for them? The teachers tell me what I need to hear about their academics. I want to know about their social settings. Therese Veach – (Both mom and teacher) my mom expert advise for starting school would be- Be a calm quite place for your kids when they come home from school. Sometimes things can be chaotic and the kiddos are tired and just need to be with their mom. Evy’s Tree employee Trish (wearing the Lisa in Blush) – “My advice for school starting; plan ahead for meals and carpooling for sports. That way when the afternoon gets crazy you can still have time to be present and help with homework etc.” Trish has three kids who seem to be very excited for school based on their replies to our question about what they’re looking forward to most; 6th grader Kate is looking forward to recess, Freshman Max is anticipating lunch time, and senior Jacob said that the best part of school is playing basketball and baseball.